My inbox is overflowing and threatening to break out, & grab me by the throat if I don't answer some of your many questions soon! In an attempt to keep it at bay, I have decided to start a Frequently Asked Questions page. So if you have been waiting patiently for me to answer a question, you might just find the answer here. If you have a question that is not covered in the following topics, please feel free to email me at bloom97@bigpond.com and I will endeavour to provide an answer as soon as I can. How do I prepare my stitcheries? I transfer the pattern to my fabric using a sharp lead pencil & a light box. I also fuse a layer of Weaveline, a light fusible interfacing to the back of my stitcheries. Do I use a hoop? I always use a hoop when I embroider. I use an everyday, inexpensive wooden hoop. It holds the fabric firmly, but not stretched drum-tight. Does my embroidery go lumpy after I remove it from the hoop? Not usually. Sometimes this can happen if you over-tighten the fabric in the hoop. It is also important to avoid stitching with a tight tension. Stitches should rest flat against your fabric, but not pull tightly. Do I iron my stitcheries after they are stitched. I always press my stitcheries on completion, but always from the back of the work. I put a big fluffy towel on the ironing board, place my work face down, and press gently. This ensures your stitches won't flatten. 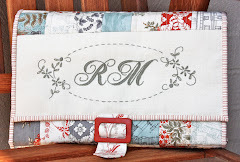 Can you quilt with a normal sewing machine, or do you have to take it to someone with a large professional quilting machine? 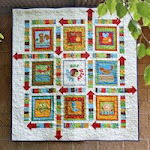 Until recently, I always quilted my quilts on my domestic machine. It is difficult to manoeuvre a large quilt on a domestic machine, but it is certainly possible & less expensive. I have taken my last two quilts to a professional quilter, simply because it is a whole lot quicker & I have decided life is too short to be wrestling with quilting my own. I feel like I am 'cheating' to a degree, but I'm sure I'll get over it! 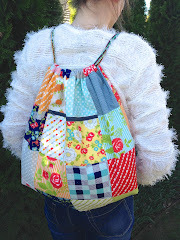 Do I make and sell 'Frilly Dilly' bags? How I'd love a dollar for every time I am asked this question! I don't make Frilly Dillies to sell. I make them for friends and family. As is so often the case, by the time you add up cost of materials and time invested, it is simply not profitable to sell these bags. But most importantly, it would be quite wrong to do so, since the original pattern is designed by the very talented & generous Janelle Wind. I would never consider breaching her copyright in such a way. Do I sell my own patterns? Well, no ... Do I dream of selling my own patterns? Daily! Do I have time to sell my own patterns? I don't think so. My family & work commitments preclude it really. Am I brave enough to give it a go? Probably not! How many yards are needed for the backing and binding to make my 'Sweet Menagerie' quilt? How many Dear Jane blocks have I made? What type of camera do I use, and have I done a course in photography? Do I have any photography tips? In terms of photography, I am entirely self-taught. I have always been interested in photography, but a course is on the 'to do' list. I use a point-and-shoot camera, which frustrates me enormously. So many of my photographs of embroidery or blooms require a macro setting, and my camera is very limited in that respect. The lighting has to be 'just right' for me to take a good image. I often take many images before I am happy with one. I have been dropping hints to my Sweetness about our 'need' for a digital SLR for some time now, but don't seem to be making any progress! Use the macro setting (usually a tulip symbol) when taking closeups. Work on getting perfect natural light. Avoid direct sunlight. Bright, solid shade is good. Avoid using a flash. Opt for natural light if you can. Consider taking shots of projects or blooms at an angle, rather than front on. Read your camera manual - boring I know, but usually helpful! Often cameras have presets for certain types of shots eg. low light, portraits, etc.